Flowers for vegetable gardens? Yes, you read that right! Flowers are not only beautiful but are amazing companion plants for your vegetables. Flowers can deter bugs, attract beneficial insects like pollinators, enrich the soil and even improve the flavor of the vegetables in your garden. I have 7 flowers that you should consider planting in your veggie garden! What are some tips on gardening for beginners? Maybe you’re just starting your first vegetable gardening and this whole companion planting thing seems a bit much. Don’t fret! I have some great tips for beginning vegetable gardeners to get you started right from the get-go! Know your planting zone. This is KEY for planting the right vegetables at the right time. Trust me if you live in Augusta, Maine then you won’t be planting at the same time those here in Phoenix, AZ! Find your planting zone here! Start Small! The biggest mistake I see in new gardeners is trying to go too big right from the start. When I started my vegetable garden it was ONE 4×4 bed. Yep, just one. Add one each season or each year as you feel more comfortable and have success. Plant what you eat. Don’t start planting crazy veggies, just plant what you already know you and your family enjoy eating. This will make the most out of your garden and garden experience. Pick seeds and transplants that work for your area. Again, zones / areas come into play when picking the right variety of any vegetables. 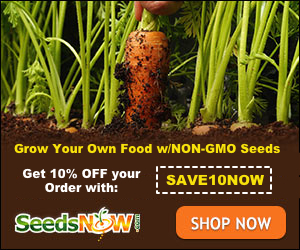 SeedsNow does a great job of offering varieties by gardening zones. How should I prepare soil for a vegetable garden? This is a great, and very important, question. Your soil is the foundation for your garden. If it isn’t rich, healthy and full of life, your garden won’t be either. Compost is really the key here. Either you need to be composting or you need to find a good source for your compost. What is your favorite vegetable to grow? I have 10 vegetables that I plant every year because they are delicious and VERY easy to grow. Tomatoes – See my guide to growing tomatoes at home. Sweet Potatoes – How to grow sweet potatoes. Zucchini – Tips on growing summer squash. You can read more about easy to grow vegetables here! Ok now that we’ve gone over some gardening basics let’s get down to those flowers you want to plant in your vegetable garden! Often referred to as the “bee plant”, borage is a great at attracting bees to your garden. Without bees and other pollinators we wouldn’t have any growth! Borage will also attract other beneficial bugs to your garden. Borage will also repel pests like horn or tomato worms and cabbage moths! And if that wasn’t enough for you, borage planted near your squash will actually improve its flavor. Find out more about Growing Borage for Health and Home. When it comes to planting flowers in the vegetable garden, NOTHING beats the marigold. Marigolds are a beautiful and powerful companion plant for your vegetables. They will attract pollinators and repel pests. Marigolds are especially good at protecting your tomatoes from nematodes (nematodes), slugs and tomato horn worms. They will also keep beetles, slugs and leaf hoppers at bay. 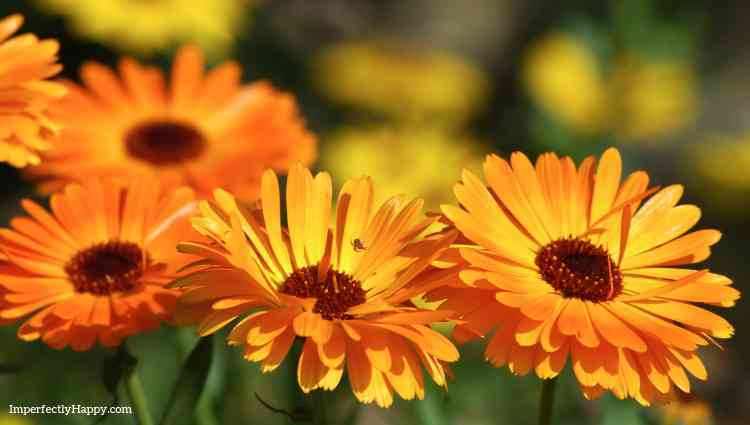 Calendula is a wonderful medicinal herb as well as a companion plant. However it is important to plant it strategically. Calendula will repel beetles and horn worms but can attract the dreaded aphids. However, t is a great “trap crop” to plant next to vegetables that are often plagued by aphids; the aphids will munch on the calendula and leave your peas alone. Lavender is one of the most universally wonderful plants around. But let’s just keep the talk to lavender in your vegetable garden. Lavender will work to repel bugs like cabbage moths. But it will also help to keep deer, mice and rabbits away as well; they don’t like how aromatic it is. Lavender is particularly good for Brussels sprouts, broccoli, cabbage, cauliflower and celery. Nasturtiums are another great trap crop for aphids and do well in cooler fall temperatures. Planted with squash they will give them protection from squash bugs and beetles. Try planting your nasturtiums with broccoli, Brussels sprouts, cabbage, cauliflower, cucumbers, kale, kohlrabi, pumpkins, radish, squash, tomato, and potatoes. Are Sunflowers Good Vegetable Companions? Sunflowers aren’t often listed as a companion plant for vegetable gardens but you really should give them a look. They offer shade for crops like lettuce as well as attracting pollinators. They can attract aphids too so planting them with chives can help to repel them and still get the benefit of the sunflower. Zinnias are master magnets for bees and hummingbirds. You know why bees are good but did you know that hummingbirds eat nasty pests from your garden too? I love them because they’ll eat whiteflies which have been an issue for us in the past.! The zinnia will deter cucumber beetles and horn worms but attract predatory wasps that feast on aphids, caterpillars, beetles, scale, and flies! I love to plant flowers for their beauty and scent; and I did this long before I became a vegetable gardener. Now I choose beauty with the power of companion planting – that is a win-win for me. What are you favorite flowers to plant in vegetable garden?